The UPPAbaby Vista is a high-end stroller that works with several different infant car seat brands and the award-winning UPPAbaby Mesa. We tested this product with the Mesa as well as the Chicco Keyfit 30 and both worked well, with the Mesa showing a slight edge for ease of attachment. The downside of the Vista as a car seat stroller is it is one of the heaviest in the group and not something most new moms want to lift or carry. So while it has the largest storage bin and a cool adjustable handlebar, it doesn't meet one of the key criteria we think parents should look for in a stroller/car seat combo. However, depending on your long-term goals, it is an impressive product for growing families and multiple children that won awards in our Full-Size Stroller Review and our Double Stroller Review. UPPAbaby has made some changes to the Vista stroller in 2018. You can read the details of the new version below. The changes that UPPAbaby has made to the Vista are subtle, but add an additional level of user-friendliness to make the stroller that much better. The most visually apparent change is in the color selection and the addition of leather accents to all styles. The bassinet has an extra 2.5 inches of length on the inside without adding extra bulk on the outside and the front wheels have been redesigned to be more rounded similar to those on the back side. Car seat compatibility and overall functionality is still the same, so our review will still give you a good idea of what the stroller is like. Below are the two strollers, the 2017 version on the left and the 2018 version on the right. The Vista won an Editors' Choice award in our double stroller review because it offers versatile seating options with room to grow. We think most families with multiple children will find it is a great solution for their infant car seat needs despite its heavier weight. The UPPAbaby Vista works well with up to two infant car seats from various brands. However, its larger size and heavier weight mean it is better suited for multiple children than as a great frame stroller. Based in the U.S., UPPAbaby is a company with more than ten years of experience with juvenile products. They draw inspiration from their daily personal experiences with family for product development. UPPAbaby strives to make each product light, easy to use, safe, and fun while keeping them convenient, usable, and stylish. The UPPAbaby company makes several strollers including lightweight, full-size, and double products. They also make an infant car seat, the award-winning UPPAbaby Mesa. This chart is a comparison of the overall scores for the products in this review, including the Vista Combo (in blue). The information provided in the sections below includes details on how the Vista Combo performed during testing compared to the competition. Using the Vista with other brand strollers requires the purchase of an additional adapter like the Chicco Keyfit 30 adapter shown here. Using the adapter is easy and attaching the infant car seat is simple enough. The Vista earned a 7 of 10 for ease of car seat attachment. This ties with the UPPAbaby Cruz Combo and Peg Perego Booklet Combo for ease of attaching car seats to the stroller. The high score for this metric is the Doona Combo with a score of 10 as it is a single product that combines car seat and stroller, so no attachment is required. The Vista car seat attachment varies depending on the car seat you chose. The two seats we chose to test with were the UPPAbaby Mesa and the Chicco Keyfit 30. The Vista is also compatible with the Maxi Cosi Mico, Mico AP Mico NXT, Citi, Cabrio, CabrioFix, Nuna, Cybex Aton, Cybex Aton 2, and Aton Q. The UPPAbaby Mesa does not require adapters when combined with the Vista, so there are no parts to misplace. The side attachment points for the toddler seat work with the Mesa. The seats can be interchanged quickly making it a good choice for parents with children of different ages. The seat clicks into place and does not require any straps. It is easy to attach and remove. You do need to line up both sides, but it isn't as difficult as some of the competition. We didn't have any trouble installing the seat properly and we feel the Mesa is easier to install than the Chicco Keyfit 30. Because other brand car seats require an adapter to attach to the Vista, they will sit higher up on the frame which changes the center of gravity of the stroller. The Chicco Keyfit 30 requires an additional adapter, the UPPAbaby Vista/Cruz Infant Car Seat Adapter for Chicco available for purchase. It is a loop style attachment that connects to the side attachment points where the toddler seat sits. The loop does not require assembly and clicks in place fairly easily. The carrier portion then sits down inside the loop and clicks itself to connect. Connection requires a little bit of pressure, and occasionally we thought it was fully connected when it wasn't, so a good tug on the handle is needed to ensure the carrier is secure. With no seats attached, the Vista actually folds into a relatively small package for a gear item of this magnitude. The Vista earned a 6 of 10 for weight and folded size. This weight is about average for the group but heavier than some because the Vista is designed to work for 2-3 children. The Vista is one of the heavier options in this review with a frame weight of 19.3 pounds without the toddler seat and canopy. The heaviest stroller is the BOB Revolution Flex with a score of 3 and an overall weight of 26.5 lbs. The lightest in the group is the Baby Trend Snap-N-Go EX, a bare bones frame stroller that weighs around 10 pounds. The Doona has a car seat stroller combined weight of only 16.5 pounds, which is heavier for a stroller, but the lightest for combined weight in this review. The Vista earned an above average score for maneuverability and performed well in our tests compared to air-filled rubber tires that rule the metric. With a score of 7 of 10, this stroller tied with the Baby Jogger City Mini Combo and the Bugaboo Bee. The BOB Revolution Flex earned the high with a 9. Unlike the frame style products, the rubber tires on the Vista help make it easier to maneuver. The locking swivel front wheels help it manage uneven terrain better and the single front wheel design makes it easier to push than the double wheel design seen on some of the competition. You can lock the front wheels in place on the Vista to help it stay on track over uneven terrain that may otherwise pull the wheels off course. It does work better on flat and hard surfaces than grass and gravel, but if you need to do it, it will for a short distance. The wheels feel more solid than the UPPAbaby Cruz and the tires have thicker rubber. The rubber will offer baby a little more comfort over rough terrain, but the foam filling means you'll never have a flat. The Vista has 4 wheel shocks for a little more support to the overall ride. For more details on the maneuverability of the Vista, please check out our in-depth look of the Vista in our standard stroller review. The Vista has a telescoping adjustable handlebar that works with the press of a button. The handlebar is shaped nicely and wrapped in leather or foam depending on your textile choice. The handlebar on the Vista is adjustable by telescoping in and out. The adjustment is smooth and stable without the flex of the rotating style adjustment found on other models. The bar itself has a center plastic piece with foam or leather wrapped edges and the transition from one material to another is relatively smooth. The Vista is easy to use and comes with useful features like storage bin pockets for easier organizing on the go. The Vista earned a 6 of 10 for ease of use, which is the second highest score with the Chicco Bravo earning a 7. Ease of use impacts your everyday experience and can be the difference between smooth moving and frustrating experiences. Folding the Vista is easy, but it requires two hands to pull up on the frame locks located on either said of the handlebar. The Vista is super easy to fold and relatively small for a stroller of this magnitude. Nearly half of the strollers in this review are larger when folded. This product self-stands, auto-locks, rolls for transport like rolling luggage. It requires 2 hands to fold and unfold, with a 2 step process. While it is heavier than the UPPAbaby Cruz, it is easier to fold with less movement in the frame and less shin banging in our testing. The Vista has single action brakes that are easy to set and release with a foot-friendly pedal that pushes to set and release. It also features color-coded indicators that relay the brake status at a glance; green (above left) for go and red (above right) to assure parents that the brakes are fully set. Despite an awkwardly placed cross bar running through the storage bin, the Vista has a large basket with the highest max weight capacity in the group of 30 lbs. The Vista stroller has the greatest storage capacity of the group, with a max of 30 lbs being allowed in the lower storage bin. The only basket that comes close to this is the Cruz with a max weight of 25. The competition are all less than 11 lbs. The basket has a cross bar that is curved up and travels across the middle of the basket. You can still place items on top of this, but it limits the overall capacity of an otherwise really cool bin. The bin also has some sewn in pockets for easy organizing. The Vista has a large canopy that we like. Unfortunately, however, when you remove the toddler seat you lose the canopy as they are one unit. This means the only canopy for use in the stroller car seat combo is the canopy on the carrier. The Vista comes almost entirely pre-assembled and is easy to setup with a quick start guide that is easy to read. The Vista earned a 9 of 10 for ease of setup as it came somewhat pre-assembled. It took us about 5 and half minutes to get the stroller from box to ready to roll. It comes with a quick start guide with 8 steps and we did not need the manual to put it together. The unpacking actually took more time than the assembly, but the packing detail meant no broken or bent pieces in the box. The new Vista continues to impress with quality materials and a design that doesn't flex under pressure and works well. The Vista earned an 8 out 10 for quality. This is the high score for the group. 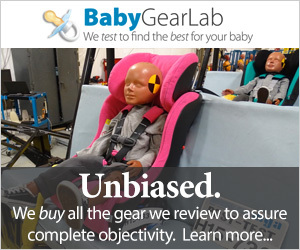 In general, we find all UPPAbaby products to be higher in quality than most baby gear. The frame is made of a lightweight aluminum alloy that is smooth, has few connection points and moves well without rattle of flex. The tires are foam filled rubber with a dense plastic wheel. The overall fit and finish of this frame are nice and well thought out with adjustments and buttons placed in useful locations. It has a clean look that isn't cluttered or cumbersome. The UPPAbaby Vista/Cruz Infant Car Seat Adapter for Chicco — This car seat adapter works with the Chicco Keyfit 30 car seat and attaches to the toddler seat attachment points. The UPPAbaby Vista/Cruz Infant Car Seat Adapter for Peg Perego — This adapter will work with the award-winning Peg Perego Primo Viaggio 4-35 infant car seat. The UPPAbaby Vista/Cruz Infant Car Seat Adapter for Graco — This adapter will allow you to pair the Vista with a variety of Graco brand infant car seats. It is not compatible with all Graco options, so you'll want to verify compatibility before purchasing. UPPAbaby Vista/Cruz Upper Infant Car Seat Adapter for Maxi-Cosi — This adapter will allow you to use some Maxi-Cosi infant car seats with the Vista. It also works with seats made by Nuna and Cybex. The UPPAbaby RumbleSeat-- If you would like to use the stroller with an extra little one, you can get a second seat. The UPPAbaby Upper Adapter — These adapters are made to raise the height of the upper seat. They are required when using two seats of any kind on the Vista in order to increase the distance between the two passengers. The UPPAbaby Lower Adapter — These adapters are used with a similar end in mind to the upper adapters. They further separate one seat from the other. We also reviewed the UPPAbaby Cruz Combo in this review and in our full-size stroller review. While we like the Vista, the Cruz is similar, lighter, and a good choice for most families that will save them around $300.